The thing about blogs is trying to keep up with one. 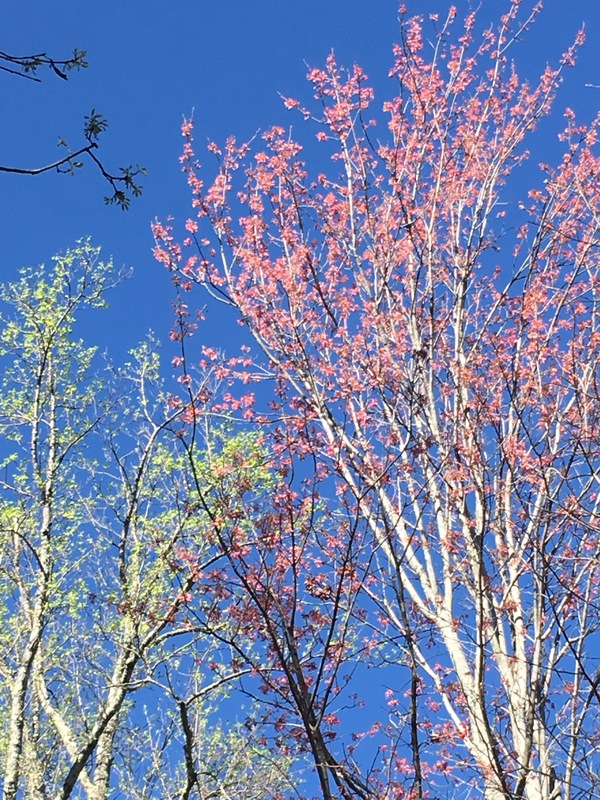 We don’t have the internet for a few days here and there, the days get busy dawn to dark or a sudden health situation arises that essentially erases a week of your life. Ahh, but those conditions don’t apply today, so there is no excuse. Truthfully, there is often no excuse. I get lazy. I get complacent. I get behind. Over the past several weeks, we have towed little Gerry another four trips of 18 miles to Hendersonville, 144 miles from Hendersonville to Hamilton Lake State Park in South Carolina, 321 miles from SC to Anastasia State Park in Florida, and then from there to the Santos Campground in Ocala for a trip of another 90 miles. Our total Winter 2017 trip is now to 1,779 towing miles and we are still averaging about 22 mpg when we tow. Well, that updates our current location. Dry facts is all you get today, and again, with best intentions, I hope to carry on soon with some posts of more substance. 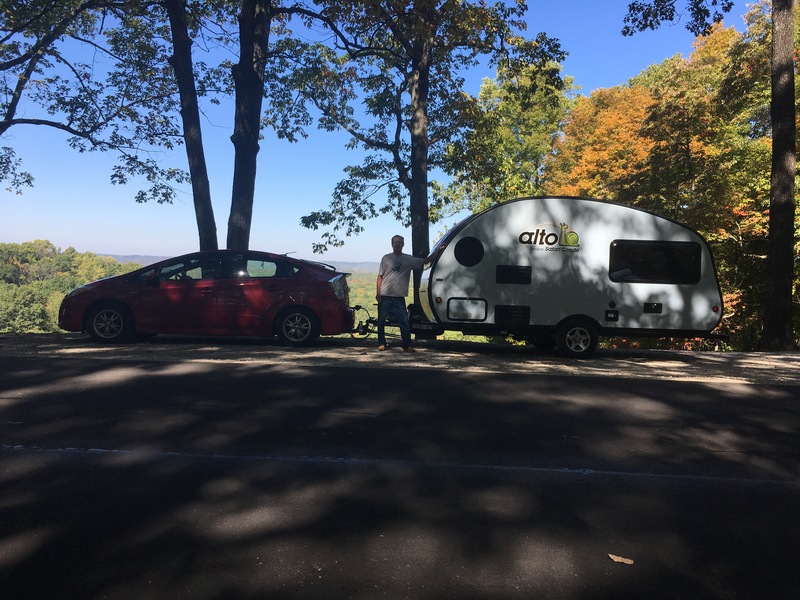 Prius and Gerry the trailer have been parked in Hendersonville, NC, about 18 miles south of Asheville. Our tasks have been to visit with family, house hunt, mountain bike and explore the area. We’ve been doing pretty well with all! There are so many gorgeous rivers gorges and waterfalls. We have been to several so far. Some are in the Dupont State Forest area, and we have visited another a little further south on the Green River near Saluda. 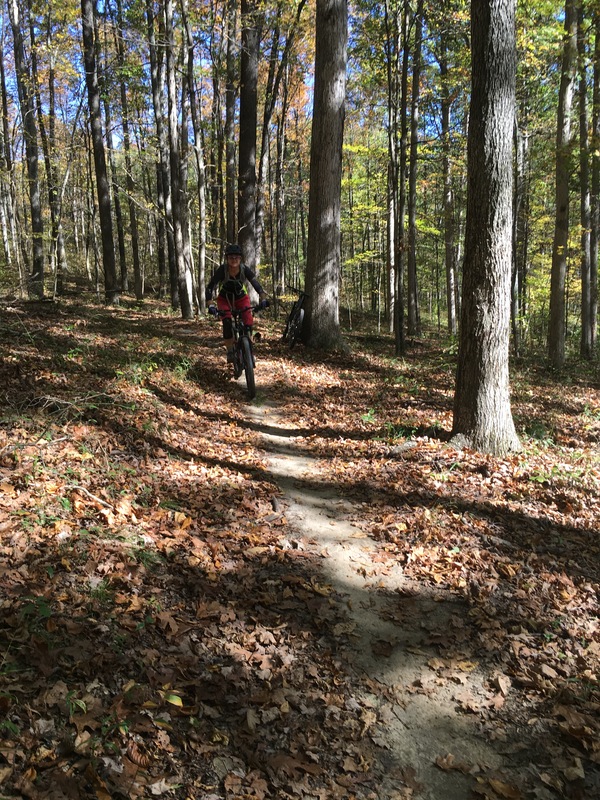 The newest trail at Brown County State Park is a series of two thrilling, rollercoaster downhills, full of twists and turns, jumps and berms alternated with two sustained climbs. The trail is superbly built – if you stay focused and on track, your bike will know what to do. But don’t let your mind wander or you may be off the course, and control your spoed or you may be more airborne than you want. The sign at the trailhead includes three skulls and atronly recommends that riders roll features the first time through. Good advice, I think, as some of the tabletop jumps include two tables and if your skill level is lacking, again, you could be in so e serious trouble. But, for riders like me who don’t jump, riding with controlled speed let’s you have a ton of fun, rolling and swooping the berms and rolls. Lots of room to camp here, as well. The spacing is pretty close, and the park does get busy. It was autumn leaf season and they also have a big Halloween campsite decorating contest and a party for the kids, so Halloween weekend is full. A reservation on the weekends through October is mandatory, and during the week you would more than likely be ok calling from the road. The bathhouses are clean; hot water lukewarm at best for the showers, toilets were well-stocked with tp and clean. Our trip-ometer turned over 1000 and stopped at 1049 miles today, shortly before we pulled in for an overnight stay at the friendly WalMart in Clinton, TN. The miles went by at 21.9 miles per gallon, including a couple of mountains in Kentucky where we were faster than the semis. It is convenient that many Walmarts allow overnight parking. It’s for when you just want a place to eat, sleep and get up and go again the next day. Oh yeah, and do a little shopping. Walmart, as we know, is no dummy. Actually, I went for over a year without setting foot in WalMart. How far I have fallen! We usually call ahead and ask if they permit overnight parking, and ask where to park. You can usually see a few semis and other trailers there, too, so just go where they are. Hopefully, the overnight guests leave promptly in the morning before the store’s busy hours and leave no trace. We know of at least a few WalMarts who have stopped this perk because of abuse of the privilege. 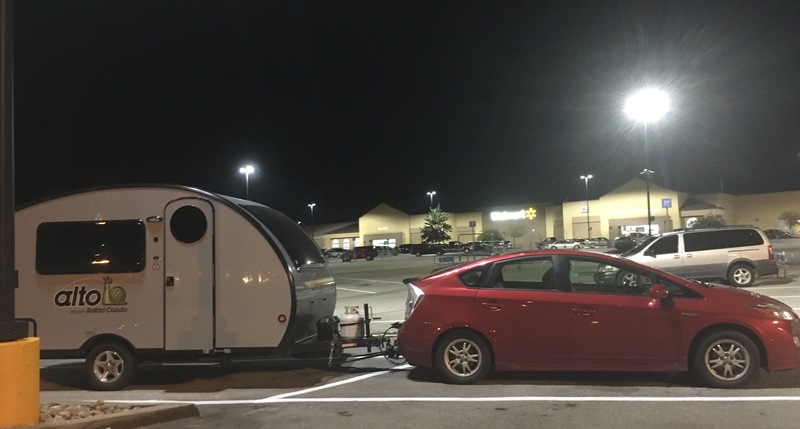 Our first WalMart of the trip was in Bloomington, Il, and we also spend two fanastic nights at Brown County State Parkin Nashville, Indiana, where the mojntain biking was superb, and certainly deserves it’s own post. Soon. Or, alternative title, Go Where Large Rigs Can Not Go! Paris Mountain State Park worked out to be a convenient place for us to spend a two day gap between our last stretch at Hamilton State Park and our next two-week stretch Asheville. Actually there are a few spots for the big ones, but make sure when you reserve that you will fit at your site. The sites are quite close together, but our neighbors and those we have met here are very respectful. 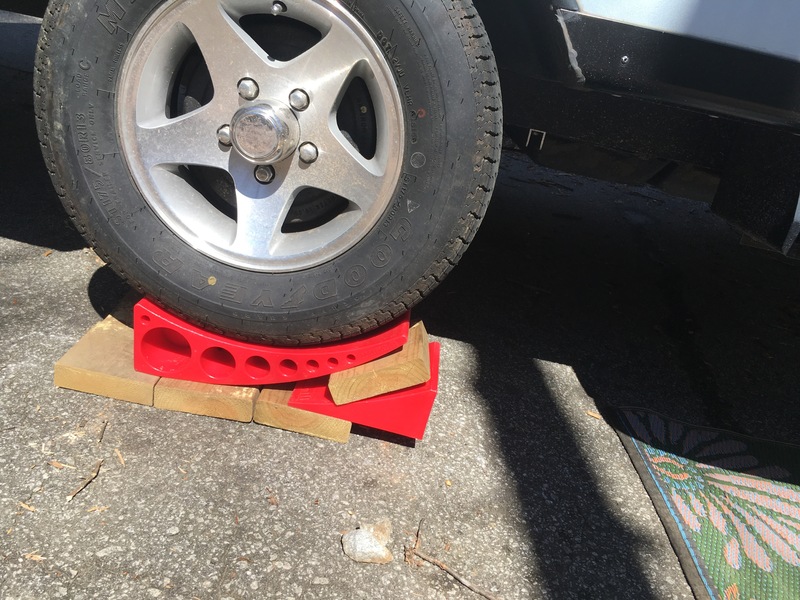 There are very few level sites, so have your blocks and ramps ready. The trails are busy – hikers and bikers – steep, and challenging, but tons of fun. There is no mountain biking allowed in the park on Saturday, and Sunday was a little too busy. Try for a week day, if at all possible.